Make a checklist to review any time a Realtor is bringing someone in to look at your home. Nothing fancy, just something to remind you to do all the little preparatory tricks on this list. First impressions are always critical, and your driveway is one of the first things a buyer will see. Here's a quick tip that may be the solution for your cement driveway: Try Drano® or any high-powered liquid drain cleaner and sweep those oil stains away! Please use caution and read all manufacturers' warnings before you begin this task. 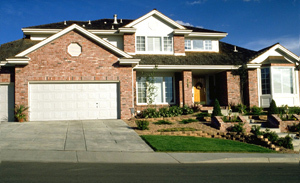 The garage door is one of the largest, most visible elements of a home. If you want to instantly enhance the overall look of your home's exterior and increase its value, replace your garage door before listing your house. After all, what's the use of a clean, organized garage if the door itself is warped, cracked, broken, or in need of painting? A fresh coat of paint will always help sell the house faster, but if you can't afford it, try this instead: paint the front door and, if needed, the entry area around the front door. 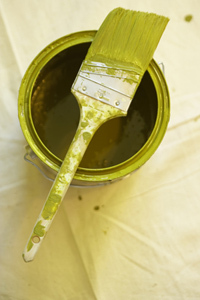 If you don't have any matching paint around to use, see if there is a plate fixture or some other item you can remove. Then take a chip of that to the paint store to obtain a paint color that matches. Keep a package of ready-made cookie dough on hand. Pop a few cookies in the oven just when a hot prospect is expected to arrive to view the home. The smell of freshly baked cookies will conjure up a lot of great memories! Try to trigger emotions that will work toward the sale of your house. Not to mention, they'll love the treat! If you don't have any cookies to pop in the oven to fill the house with a pleasant aroma, spray a little vanilla air freshener. This particular scent has a great impact. Potpourri around the house is a good idea, too. Remember, we're trying to appeal to as many senses as possible. When you are ready to list your home, it's always a good idea to have the carpets cleaned. A clean home will always sell faster, and you should accentuate the fact that you take care of your home. Leave a few pairs of shoes just inside the front door to imply that you are meticulous about the appearance of your house. If your home is decorated in dark or unusual colors, you're going to scare off a lot of potential buyers. It will be worth your while to paint your walls a neutral color, such as off-white. If you're not up to painting your entire house, at least paint the areas that make the biggest impression, such as the entry/foyer, living room, dining room, kitchen, and master bedroom. Appliances should be clean at all times. If your kitchen appliances have broken knobs, replace them. If your stove is green, your dishwasher is gold, and the trash compactor is black, have a professional come in and paint them one matching neutral color. This is much less expensive than buying all new appliances, and it will add dramatically to the "salability" of your kitchen. Polish all fixtures, brass, chrome, glass, etc. with a high polish. This will add a sparkle to your home. Now is the best time to replace old, worn-out items with something new. Use your best judgment as to which items will actually make your current house look better to a prospective buyer. When your house is up for sale, it's time to retire all those half-dead plants (both in your yard and in your house) that you keep thinking will come back to life some day. 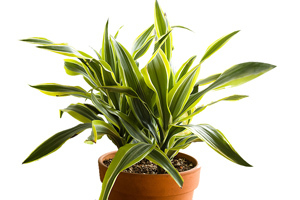 They make a mess by dropping leaves, and to put it simply, having no plant is better than having a dead one. 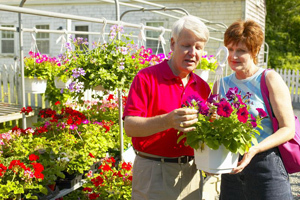 A quick solution is a trip to the nursery for a few fresh new plants. Flowers always brighten the appearance of a home, and they add a pleasant scent. If you do not want to buy fresh-cut flowers or spend money on something you will leave behind, a helpful alternative is to use clay or decorative pots as planters. 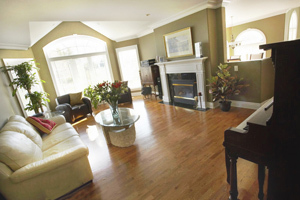 After they have helped to sell your current home, you can use them to brighten up your new home as well. Most people keep curtains, blinds, and drapes closed for privacy, but when your house is for sale, be sure to open them all. Your house will look larger and brighter. Make sure that your windows are crystal clear. If your screens are worn out and full of holes, replace them. If you can't replace tattered screens, take them out entirely to give that clean appearance. Don't forget to wipe down dusty windowsills. If you have a window that faces an eyesore, you won't want to keep the drapes or blinds open. In that case, you would keep them closed, but still maintain a neat appearance. 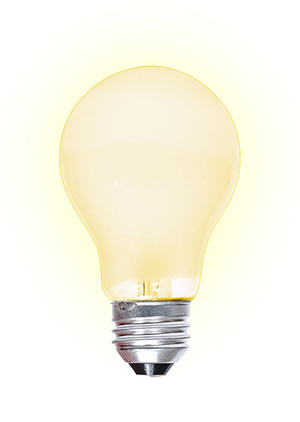 Add a dramatic appearance to your house with new 100-watt light bulbs. 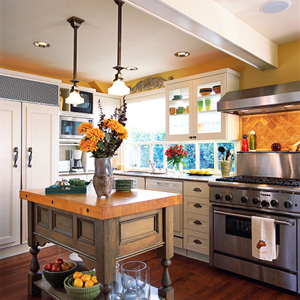 A bright house looks larger, cleaner and more appealing to a potential buyer. This will create an open feeling, similar to the many new homes that are built today with lots of windows and skylights. Remember, you're not selling furniture; you're selling a house. Keeping this in mind, you may want to remove any large or ornate pieces of furniture. Unless your taste in furniture is the same as the potential buyer's, large pieces aren't going to help your house sell. Their absence, however, will make your house appear spacious and inviting. Take as many of your personal items as possible out of your closet and store them in an out-of-the-way place. When your closets are cleaned up, they will look much larger to the potential home buyer. Abundant closet/storage space is a major selling point for most people. Apply this rule to any storage area. Inspect your house on the way out the door every day to see if there are any messes you have not had time to clean up. Kick clothes under the bed or get a couple of large, plastic tubs for emergencies. In short, don't leave your home a mess if there's any possibility that a potential buyer may see it. Just be careful not to hide your mess where it may be easily discovered, such as in a closet or cupboard! Do you ever find that you're having trouble pulling your car into the garage because you have so much stored in there? Clean it up by storing everything you can at a helpful friend's home or a rented storage unit. This way, your garage area will appear larger, and when it comes time for you to move, you will be more organized. It will take some time to get all your knickknacks packed and ready to move. Why not do it now? Wrapping these little items in newspaper and storing them will make your move easier, and it will help your house show better. Remember, less is more. 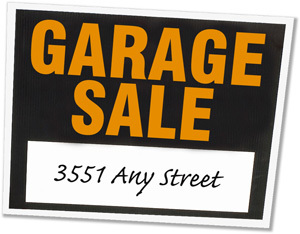 Have that garage sale you've been meaning to have, but never got around to. This is one of the quickest, easiest, and most cost-effective ways to clear out those items that make your living space look cluttered. Check with your local newspaper to see if they offer a "Garage Sale Kit" including signs if you place a classified ad in this category. If you have a pool, it should look like you're ready to throw a pool party, even if it's the dead of winter. You want to be sure to remind the buyer of how much fun a pool really is. 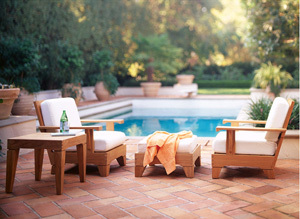 This means a clean, uncovered pool with all of the furniture out and looking its best. An empty yard sells better than an overgrown yard, probably because an empty yard looks larger. When trimming back your shrubbery and trees as you're getting ready to sell your house, don't be timid. Trees and shrubbery should not hide the house itself. Again, less is more. Use your sprinklers as much as possible to ensure everything in your yard is green. Turn on your sprinklers' manual start button whenever a Realtor is bringing a potential buyer to view the home. Newly-watered landscaping has a fresh, clean scent and a shimmer that makes it look much better than when it's dry. By leaving them on, you can also discourage any backyard exploring in the event you have unsightly areas there. Extra parking outside your house will give your property a spacious appearance. Park cars down the street so the Realtor has the most convenient parking. Also, be sure to remove children's toys, garbage cans, or any other unnecessary items from your front yard. All the buyer should see is a well-groomed property. Always leave your house while the Realtor is showing it. Remember, buying a house is an emotional experience. The buyer will tend to feel awkward inspecting the house while you are there. If you own a dog that may be intimidating to the potential buyer, take your furry friend for a walk whenever the home is being shown. Your dog's bark may be worse than its bite, but if its presence alone could potentially cause tension for the buyer, it takes away from the overall emotional experience of looking at the home. 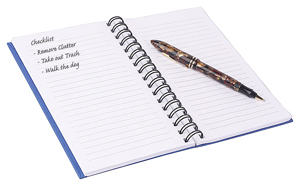 Also, make sure your home is free of pet hair and odors that may bother potential buyers. Ask your Realtor or a friend for an honest opinion. Try writing a letter explaining some of the features of your home. Talk about the schools, good neighbors, malls and shopping centers in the area, perhaps even a little history about the home. Write it in a very personal fashion, as if you were writing to a close friend. Try to create images in the potential buyer's mind of how great it is to live there. Finally, type this letter and make copies, but sign each one by hand. Put the letter in a nice stationery envelope and leave it out where anyone viewing the house couldn't miss it. game! Make sure your home has the same appeal as other homes by accenting similar attributes, while pointing out benefits your home may have that other homes do not. Price may be a sensitive issue, but it is the one thing that will sell your house faster than anything else. If you price your house right in line with the market, it's not likely to sell quickly. That's because only the 5% or 10% of houses with the best prices are selling each month. If the price of your house isn't in that lower 10% relatively, then it isn't likely to sell as quickly. It's not what your house is worth, but what someone is willing to pay. Every shopper is bound and determined to get the best deal in town. Do you honestly feel your price makes your house one of the best deals in town? Now is a good time to compare your house with others on the market in the same area.Your Realtor will able to suggest a good listing price that will help your house sell quickly. Some sellers ignore this advice and ask a Realtor to price high to see what kind of offers they get. Be aware that this can cause your house to stay on the market longer with multiple price reductions, which actually detracts buyers. Offering to make the buyer's first 3 mortgage payments or to pay their closing costs will be helpful to buyers who are tight in cash. This looks very attractive in your advertising. Many people like the idea of having a little grace period after moving into a new home or needing less cash at closing. Be sure you (or the buyer) are using an experienced lender, since seller concessions seem to confuse many less experienced lenders. Carrying back a second mortgage on your house can help some people qualify who may not have been able to otherwise. (If you need all of the proceeds from the sale of your house, this method may not work for you.) You carry back a note for, let's say $40,000, but you offer the note to the buyer for only $35,000 providing the note will be paid off within a few months of ownership. The buyer will now need to get approval for an equity line or second mortgage, which can close in 30 days after the buyer takes possession of the home. Realize that even though the buyer agrees verbally to this agreement, they aren't obligated to retire your note any sooner than the note itself states. The motivation to retire your note quickly has to come from the discount incentive. Offer to pay up to 3 points (3% of the buyer's loan amount) in order to give the buyer a lower interest rate. This could dramatically lower the buyer's mortgage payment, making your house much more affordable and very attractive. A buyer could save several hundred dollars per month with this option, and it could even help buyers who normally couldn't afford your home to qualify for and purchase it. *These suggestions may not work for every seller and not all buyers will qualify for all programs. Call us if you have questions.